Archive by Category "General News"
Our salon owner Ivo Tiberio just doesn’t stop! Just this week, not long after he came back from New York City, he was on the road (or in the sky) again – this time, to Montreal, Quebec! Instead of being trained though, it was Ivo’s turn to train the trainer! As a National Technical Trainer for the major colour company, Goldwell, it is Ivo’s job to ensure that future Goldwell teachers are communicating the brand’s message and mandate correctly, and in accordance with its global standards – and that is exactly what he went there to do. Working for Goldwell as an educator for almost 30 years himself, Ivo knows just how important it is to accurately represent Goldwell at all times while teaching fellow stylists and was excited to be able to pass along this knowledge to 9 new prospective Goldwell educators! This multi-day training program was very comprehensive and really gave the up and coming educators a true sense of what their future responsibilities will entail. We can’t wait to see what they bring to the table after this! The training did not end here though, this upcoming weekend Ivo is heading down to Toronto to do the same training all over again, but this time he will be educating 21 future educators! Keep an eye on our social media over the next couple weeks to stay updated on the Toronto training and, as always, everything else that we have going on here at the salon! Last weekend was an exciting one for a bunch of our Gravity stylists who jet-setted down to the Goldwell Academy in New York City alongside 6 other Master Colourists from Canada for an exclusive Goldwell training program! Once they got there, they were also trained alongside fellow Master Colourists and Stylists from the USA and Mexico – an amazing environment for sharing each other’s creativity! Our salon owner, Ivo Tiberio, and two of our Master Colourists and Stylists Jamie Dennis and Lindie Blackwell, attended different training events over the span of 4 days to expand their skills and knowledge as professionals in the field and also to network and interact with their industry peers! This training was multi-faceted and this time around, was focused somewhat on colour and styling but also had a unique component – a course on how to be effective teachers themselves. As you’ll see from their website biographies, Ivo, Jamie and Lindie are Goldwell educators, and this weekend was spent focusing more on how to effectively connect with THEIR audience, while educating others out in the field. The weekend training covered a number of different topics, including a seminar on social media and being an influencer within the industry, but one of the most effective parts according to our stylists was learning how to connect with different learning styles throughout their training to maximize the effects that their teaching has on others. They learned how to tailor their trainings to expand outwards from their own typical training styles, and to incorporate certain training methods for different types of learners – whether it be audio, visual etc. Alongside this insightful educator training, was of course, training that was focused on hair colour. The hair industry is currently experiencing “colour-mania” – people LOVE colour, so it’s always important for our stylists to stay on top of the most recent colour trends and product innovations so that they can deliver the very best results to their clients while behind the chair. Jamie was fortunate enough to attend a course that gave the trainees a product topic, for example, they had to use only the Pure Pigments line from Goldwell, and they were given 12 hours to make a complete 4-5 look collection, from colour to cut and everything in between, and then they had to present that collection to their peers, and ensure that their presentation flowed effectively in a large group of people. And as if all of this education wasn’t enough – both Ivo and Jamie (both of whom are educators for different Master Colourist Courses) learned even more about the Master Colourist Training Program, and how it has been both simplified BUT has also been made more challenging – to be a more effective training program for future elite stylists who are seeking a Master Colourist title. The last leg of the educator training this past weekend was focused on how to effectively use social media as a stylist, and how to become an influencer in the field using the power of Instagram and Facebook to show off their talent and connect with followers and potential clients through photographs! This training is so important and so helpful, considering how social media-crazy today’s society is. We always love being able to share with all of you the exciting stuff that’s going on inside the salon, but also the exciting things that we do outside of the salon – including all of the advanced education that our stylists receive. We always want our clients to know that when they visit our salon, they are receiving the best of the best treatment from our stylists who have a passion for what they do and for furthering their education! We can’t wait to share with you where our next big adventure takes us! Spreading our Wealth of Knowledge Here at Gravity! It’s been a fun week for education for one member of our Gravity Salon team! Our very own Jamie Dennis was out at the Goldwell Academy this week co-teaching the Master Colourist Designer Course to a bunch of amazing stylists from across Canada and the United States! During this class, Jamie used her wealth of knowledge and experience to teach aspiring Master Stylists how to become elite hair designers and how to utilize the skills that they have mastered during their foundational training and take them to the next level while working towards becoming a Master Stylist. To become a Master Stylist, one must have their standard hairdresser certification, but then must also complete a number of other courses that will help them to hone in on their abilities and to become elite stylists who are set apart from the rest. The Master Colourist Designer course is just one of four courses that stylists must complete to get their Master certification, and it does more than just teach these stylists how to do amazing hair. Alongside new skills and techniques, these stylists are also taught how to facilitate the entire customer experience from offering them a beverage the minute that they walk in the door, to making sure that they are looked after for their next appointment before they leave the salon. This is what Goldwell Educators refer to as the “Colour Cycle,” a circle that starts with the greeting at the front door and client consultation, colour preparation and application, and the interaction that takes place once the colour is actually complete. It also teaches stylists how to speak to their clients in terms that will resonate with them and make them feel comfortable during the transition from consultation to the actual application of colour, and to ensure that they have a full understanding of the process that is about to take place. The Master Stylist Designer Course is three-days long and takes place at the Goldwell Academy. Each day, the stylists are expected to facilitate the entire process from start to finish on live models each day, and are evaluated at the end of the course. Upon successful completion, the stylists receive a Sapphire Medallion Certification and become one step closer to being a certified Master Stylist. Jamie has taught this course for 15 years, and has also created some of Goldwell’s most iconic colour classes, and is always open to sharing her wealth of knowledge with all of the eager stylists who sign up for the classes that she teaches both at the Academy and also across North America. Jamie is not our only stylist who is an educator outside of the salon though, we are lucky enough to have our salon owner and one of our other master colourists and stylists, Lindie Blackwell, who teach on the Goldwell Education team as well. Ivo and Jamie are both National Artists and Educators, and Lindie is an International Guest Artist who has travelled globally to teach some of the world’s best stylists, as well as stylists right in our own backyard at the Goldwell Academy in Mississauga. Lindie teaches a number of elite colour courses and seminars and is always having her brain picked by stylists about anything from colour mixing to creative colour placement. Ivo also teaches the Master Colourist course, as well as the Hair Mentor Course and Hair Sciences course, and is considered to be a real mentor in the both the styling side of the industry, as well as the education side of things. Another one of our Senior stylists and colourists, Esther Timewell, alongside Ivo, is also an educator for the hair styling and product line, KMS, and both her and Ivo have taught a multitude of courses on styling with all of the different products that KMS has to offer and how to use them in the most contemporary and trendy ways. The best part about having all of these brilliant educators here at Gravity is that they are able to bring all of their knowledge back to the salon to share with the other stylists and if we’re lucky, to teach courses on some of the skills that they have perfected! Just last month, we were lucky enough to take the morning off of styling to have Lindie teach us all about Goldwell’s brand new iconic colour line, Pure Pigments. Lindie has done a ton of ad campaigns for Pure Pigments and has applied all kinds of different colours on different hair types, and she also used her expertise to teach the rest of the salon how to apply this new product effectively and we have seen nothing but amazing results in the salon! We are so grateful to have such an educated and talented team, and we look forward to continuing our education for the years to come to be able to expand our knowledge and be the best stylists that we can be for our amazing clients! 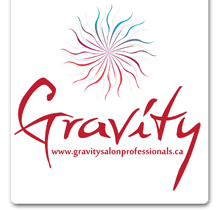 Our accomplished set of stylists is just one of the many reasons why Gravity is Barrie’s best salon! Help Us Raise Money for Barrie and District Christmas Cheer This Holiday Season! Here at Gravity Salon, we know just how important it is to be involved in the community and we are constantly trying to find ways to do this, and to help support our fellow local businesses as well. That’s why this year, we have decided to do something that will combine both of these initiatives for the holiday season. With the support of many of our fellow local businesses, we have been able to put together an amazing gift basket with a huge variety of local goods and services to raise money for the Barrie and District Christmas Cheer! The outpour of generosity that we have received from the businesses that we have reached out to in the last couple of months has been absolutely amazing, and we can’t wait for one lucky winner to be able to take home all of these amazing items to gift to their loved ones on Christmas or to keep for themselves! How this will work, is that from November 7th until December 15th, we will be selling ballots to our clients and their family and friends at $10.00 each or 3 ballots for $25.00! As of right now, the basket is valued at $538.00, and is open to any local businesses in the area to make donations up until the day that the winner is chosen. All ticket prices will remain the same regardless of the value of the basket, and all of the proceeds will be used to provide families with food, Christmas dinner essentials and toys for children up to the age of 16 for Christmas morning. Each family through Christmas Cheer requires approximately $350.00 depending on their family size to ensure that they receive all of their Christmas essentials, and Christmas Cheer does their best to ensure that every family that they assist receives an equal benefit from the organization. Our goal is to raise enough money to sponsor TWO families, which would be equal to $700.00. We know that we will be more than capable of doing this, we just need your help and support, and you will also get the opportunity to get a little something for yourself! Keep a close eye on our social media every day for a spotlight on all of our amazing donors so you can check out what their businesses are all about and see why we love them all so much! Your Home @ Java Cup Co.
Globalzoom 2018 came to TORONTO! Not too long ago, some members from our Gravity family made appearances at Goldwell and KMS’s biggest international hair show and competition – Globalzoom! Globalzoom is a true international show, with stylists coming to compete and showcase their talent on a live stage from every major country from across the globe. Globalzoom takes place at a different international venue every single year, but this time was extra special for us because even though our stylists have had no problem using the competition as an excuse to globe trot (Berlin, Barcelona, Las Vegas…), the 2018 show was in our favourite concrete jungle and our very own backyard – Toronto, Ontario! This year our salon owner, Ivo Tiberio, made the trip down to the city to take part in the iconic event, and many of our other stylists have attended at the international destinations in years before. What is even more amazing though, is that besides going for the entertainment and social aspect – one of our very own team members, Lindie Blackwell, was an on-stage hair artist who showcased her unmatchable talent while working the show for the entire weekend! Lindie used her skill and innovative colour techniques to wow 4,200 of the industry’s best international stylists with Goldwell’s newest trend releases and brand technology. More specifically though, Lindie was showcasing the stunning new colour-morphing technology of Goldwell’s new and iconic Pure Pigments line. Lindie did this live on-stage, with real models, in front of thousands of people, and made it look like it was a cakewalk to everybody who was watching. This is so exciting for us – not only because we get to brag about how cool our stylists are, but because we have somebody right at our fingertips who is so knowledgeable about this amazing new product, and can help us to utilize it to it’s best potential in our very own salon! This isn’t the first year that Lindie has worked as an international stage artist for Globalzoom; in fact, she also worked the Las Vegas and the Barcelona shows as well, but it was amazing to see our very own fabulous Canadian talent representing the industry’s best colour line in a venue that is so close to home. Another personal connection that Gravity has with Globalzoom is that one of our day-one stylists, Jamie Dennis, is a three-time semi-finalist, winning gold for Ontario, and ALSO won gold for Canada in 2014. This achievement took Jamie and her hair model across the world to Berlin, Germany, to represent Canada on a global platform among the world’s best international stylists. This was such a dream come true for both Jamie and our salon and it truly speaks volumes to the kind of talent that we have behind the chair at Gravity. As you can tell, we LOVE Globalzoom here at Gravity Salon and we look forward to this weekend every single year. It’s a time where we get to meet and socialize with our fellow stylists from both near and far, and a time to soak up the wealth of knowledge that all of the amazing Goldwell stage artists have to offer. We always come out of the weekend feeling so inspired by our introduction to the new season’s hottest trends and by watching the hair industry’s top stylists compete against each other in a live-show. We always return to the salon feeling re-energized and even more in love with our trade than ever before, and the best part is being able to use some of the new techniques and products that we got to check out by being at the event! With that being said, we want every opportunity that we can get to show off our new skills – so anytime you visit the salon, don’t hesitate to ask us about what we learned and how it can be used on you! It’s only been a couple of weeks since we’ve been back and we already can’t wait for next year! Globalzoom 2019 is in Vienna!!!…. Here we come! !